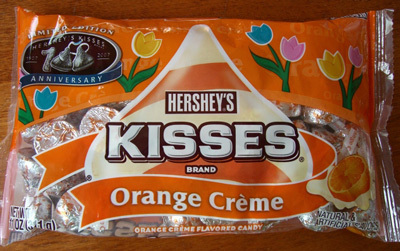 These were actually released for the first time around Halloween 05, I guess they must have been popular … I agree completely with the creamsicle comparison! They certainly look like creamsicles! I’m so happy you reviewed these! I had no idea they were Target exculsives. I have seen the Red Peep though, they’re scary! I was so upset when these disappeared after their initial run a couple of years ago, that I wrote a tribute to them on a blog. Just now, I found your article because I was searching for where to buy them this time around. I went on an unsuccessful (now I know why) multi-store search for them yesterday. Until now, I was not aware they are a Target exclusive. The only problem is, my Target ran out of them weeks ago and they have not restocked them. Now that I know, I will ask the store manager to get more in before it’s too late! Thanks for this post. And I agree with the creamsicle comparison; I tell everyone the same thing. Too good. Target cannot reorder these once they’ve sold out. 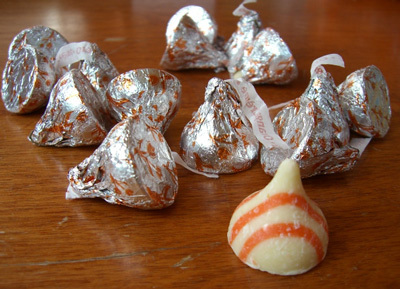 Hershey told me today that maybe if they get enough calls, they’ll add these kisses to the product line. My fingers are crossed.